Fruit Rooms v Řím, Itálie: Zarezervujte nyní! 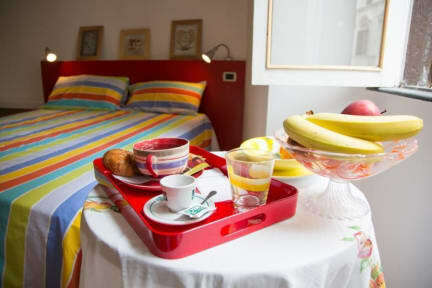 Located 450 m from Rome’s Termini Train Station, Fruit Rooms offers air-conditioned rooms with free Wi-Fi. The Colosseum is a 20-minute walk away. Rooms here all come with colourful furnishings and a desk. The private bathroom includes a hairdryer. Ingredients for a self-service sweet breakfast are provided in the property’s breakfast room. Fruit Rooms is in an area surrounded by cafés, restaurants and a local market. The property has good transport links to the city centre. The Spanish Steps are a 15-minute metro ride away. Central Station is a great choice for travellers interested in roman ruins, history and monuments.